My mini painting tray is possibly more badass than yours. Some time ago, I saw an ad for a very handy looking miniature painting tray in an issue of White Dwarf, and got the brilliant idea to make one of my own out of one of the old ammo boxes in my garage. Yes, I said ammo boxes in my garage. My in-laws used to have a gun store, and a business that sold ammunition at gun shows. 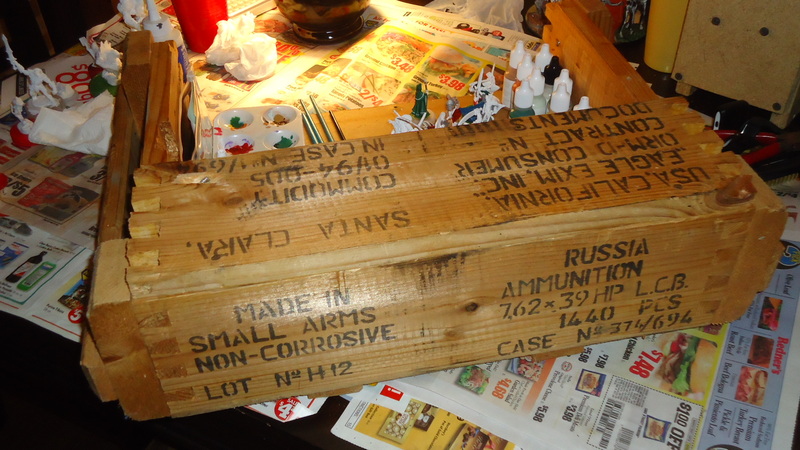 A lot of the military grade ammunition comes in very sturdy containers, very often wooden boxes. 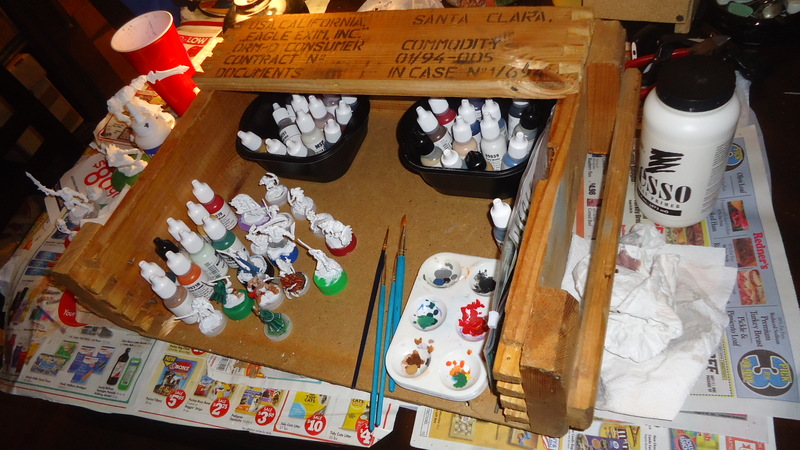 Some of the deeper crates make great boxes for RPG books, and as it turns out, the shallow ones can be turned into very badass painting trays. I lost my original tray in our house fire, but was able to grab an empty crate from the garage before we left for good. And since I recently got the initiative to start painting my Reaper Bones, I figured this would be the perfect time to put a new one together. Experiencing a little painting tray envy? Thinking you’d like to have one of your very own? Check your local gun stores or surplus shops to see if they have any empty wooden ammo crates. Our store had so many lying around that we usually just gave them away to anyone who wanted one. To make this one, I just pulled the screws out of the bottom of one of the long sides, carefully tapped the side out, and nailed it to the top of the opposite side for a shelf. Some other crates I’ve seen do not have the dovetailed sides, so you may need to get a saw involved – and sanding all exposed surfaces is probably a good idea to avoid unwanted splinters. The handles on the side make it easy to cart around when the family wants me to surrender the dining room table for dining or some other such nonsense. My old one had a small clamp lamp on the side, so I’m on the hunt for a replacement, as well as something to keep my brushes and files from rolling around. And there you have it, my utterly badass painting tray, which is possibly more badass than yours. But, y’know, that’s really just a matter of opinion and stuff.